I have read some posts questioning the legal existence of the Commission on Human Rights of the Philippines, with the argument being that there is no enabling law creating CHR. That is, while the Constitution provides for the creation of a CHR, the current CHR is created only by virtue of an executive order, which is EO 163 s. 1987. EO 163, which was issued in May 1987, or three months after the 1987 was ratified. This date of issuance is important in light of the 1987 Constitution’s Transitory Provisions. "The incumbent President shall continue to exercise legislative powers until the first Congress is convened." EO 163 s. 1987, which was issued way before the First post-EDSA Congress convened. That is, despite being just an EO, EO 163 has the force and effect of a Republic Act because Cory had ersatz dictatorial powers right after EDSA and right before Congress convened. The First post-EDSA congress convened in July 1987, about two months after Cory Aquino issued EO 163. In short, EO 163 sufficiently provides legal existence for CHR so no, CHR's legal existence is not in question. This bears repeating: THE CHR IS NOT LEGAL FICTION. Truth be told, a lot of Filipinos aren’t very happy with the CHR of late, and many are calling for its abolition mainly due to its disturbing politicization. For example, former Liberal Party Director-General and current CHR Chair Chito Gascon has been travelling all over world denouncing allegedly Duterte-sanctioned human rights violations, despite the fact that (1) there is no concrete evidence that the HR violations are indeed sanctioned by the palace and (2) it is not within the CHR’s mandate to go overseas and disparage the government. I think, however, that the Commission on Human Rights should not be abolished because the issue here is less on the legitimacy of CHR’s real purpose and more on doubts surrounding Chairman Gascon’s real motives. The House of Representatives share the same opinion, in my belief. After appropriating a measly P1,000 annual budget for CHR, House Speaker Pantaleon Alvarez said he may reconsider this if Gascon resigns [GT]. But of course, Gascon will NOT resign. Let me tell you why, then let me tell you what we can do about it. If Gascon resigns, LP will lose its best propaganda tool. The continued existence of a political party depends on its ability to project political relevance, and this is possible mainly through having party members occupy influential positions in government, positions that they can use for propaganda. That is, the continued existence of a political party is concomitant to its access to propaganda tools. The Supreme Court, via Aquino appointee Maria Lourdes Sereno. The CHR, via former LP director-general and Aquino-appointee Jose Luis “Chito” Gascon. Now, let’s discuss the effectiveness of each. FIRST, VP Leni Robredo tried to disparage the Duterte Administration, but she has neither the widespread charisma nor the intellectual aptitude so she’s largely ignored. Case in point, her popularity ratings continue to dip, with her net approval rating rivalling that of former VP Binay at his lowest point. SECOND, LP is also losing steam in the Senate. It’s primary attack dog Trillanes is toast. Its next attack dog, Senator Leila de Lima, is in detention for letting her primordial itch pave the way for the drug menace. It’s third attack dog, Kidnapper-Senator Risa Hontiveros, has become the nation’s laughing stock after gloriously bungling several times, and is at immediate risk of being perpetually disqualified from public office for wiretapping Justice Secretary Aguirre. Thus, we are left with Senators Aquino, Pangilinan, and Drilon. Note that the other two LP senators Villanueva and Recto are already members of the Senate majority bloc so I wouldn’t consider them part of LP’s propaganda arsenal. LP Senators from left: De Lima, Aquino, Pangilinan, Drilon, and Hontiveros. Trillanes is from the Nacionalista Party but he has no party loyalty, and serves as LP's attack dog in the Senate. 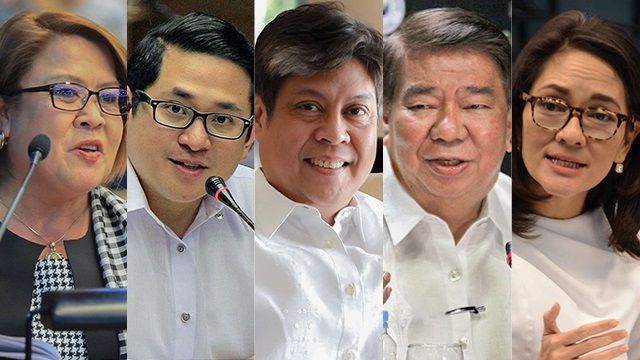 Now, Drilon and Pangilinan are LP stalwarts, but they’re political chameleons. While they would defend LP, they simply are not the kind of people who would stick their neck out for their party. Aquino, on the other hand, appears to have presidential ambitions, and if he has been intently watching Leni Robredo, he must have realized that attacking the massively popular administration will obliterate his political future.THIRD, the Ombudsman in itself is not a very powerful propaganda tool because it needs to work alongside other officials to pin someone down. And even if it were, Ombudsman Morales will step down in July 2018, so her days in power will be over 10 months from now. FOURTH, Comelec isn’t a very powerful propaganda tool either. It’s relevant only during the election season. Moreover, the embattled Bautista’s hold on power is already questionable, as fellow Comelec commissioners called for his resignation amidst the Andy-Tisha scandal. FIFTH, the Chief Justice isn’t a very powerful propaganda tool, as CJ’s typically inhibit from speaking publicly and let’s be honest: only a handful of Filipinos actually spend time reading her court decisions. Thus, we have only one avenue left: The Commission on Human Rights. Thus, If Gascon resigns, LP will lose the single most effective propaganda tool in its arsenal. So yes, Gason will not resign. But then, is resignation the only way to kick Gascon out? Is the CHR chairman an impeachable official? 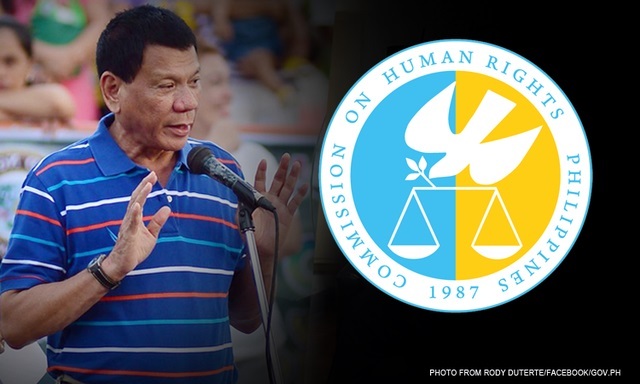 Is the CHR is a constitutional commission? At first glance, it appears that the CHR indeed is a constitutional commission, as an entire article in the Constitution is dedicated to its creation. However, Article IX, explicitly entitled “Constitutional Commission”, does NOT include the CHR in its list of constitutional commissions. Yes, there’s no CHR in the list. Some camps may argue that the CHR, while not explicitly listed in Art. IX as a constitutional commission, can still be considered a constitutional commission because the Constitution itself created it. The Chairman and the Members of the Commission on Human Rights shall receive the same salary as the Chairman and Members, respectively, of the Constitutional Commissions, which shall not be decreased during their term of office. Take a harder look at the phrase “the same as… the... members… of the Constitutional Commissions...”. Cory used the phrase “of the Constitutional Commissions” instead of “of other Constitutional Commissions”, implying that Cory herself may not have considered the CHR a constitutional commission to begin with. The [Constitutional Commissions] shall enjoy fiscal autonomy. Their approved annual appropriations shall be automatically and regularly released. In short, if the CHR is a constitutional commission, then the CHR should enjoy fiscal autonomy. The High Court ruled that the CHR enjoys limited fiscal autonomy, as opposed to absolute fiscal autonomy accorded to the Constitutional Commissions. That is, if the CHR is a constitutional commission, then the Supreme Court would have categorically stated that CHR has fiscal autonomy in accordance with Art. IX (A) Sec. 5... but the Supreme Court did not. CHR cannot be a constitutional commission. Yes, the CHR is a Constitutional Office but it is NOT a Constitutional Commission. The Supreme Court said the CHR enjoys LIMITED fiscal autonomy, which means it is not a Constitutional Commission, which enjoys full fiscal autonomy. Because CHR is not a constitutional commission, its members are NOT in the list of impeachable officials. Particularly, CHR chair Chito Gascon is not an impeachable official. Gascon’s not being an impeachable official means he does not enjoy the limited immunity accorded to impeachable officials like Comelec Chair Andres Bautista and Ombudsman Conchita Carpio Morales. With Gascon not enjoying immunity, we can actually file administrative or criminal charges against him, charges that will not be dismissed on the ground of immunity, charges that, if proven, will merit his removal from the CHR.